President Obama vowed Monday to bypass Congress and pursue unilateral changes to the country’s immigration system, defying House Republicans who say his executive actions are part of the problem. The president, speaking in the Rose Garden, said he is forced to go it alone because the House has failed to act on a comprehensive overhaul. He said Speaker John Boehner informed him last week the House will not vote on an immigration bill this year. ACLU, american civil liberties union, bad leadership, corruption, Law Enforcement, militarized police, SWAT, SWAT team, treating citizens, wartime enemies, Washington D. C.
Video: Recover Deleted Files with the NSA Backup! ≈ Comments Off on Video: Recover Deleted Files with the NSA Backup! Ever accidentally delete an e-mail or file? Don’t worry! 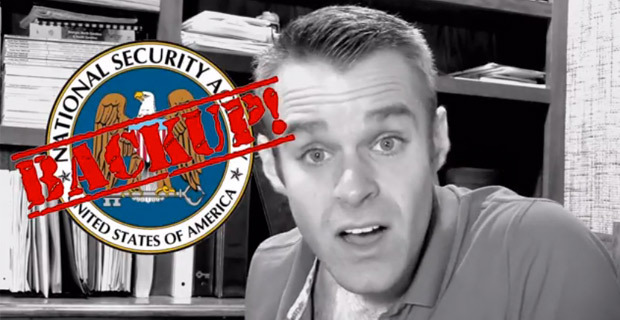 With the NSA Backup, all your data is just a phone call away, and you don’t even need to give your name because the NSA already knows who you are! And the best part? You’ve already paid for it!